A tiny hermit crab finds his very own shell. He doesn’t feel like sharing it, but two funny looking sea creatures convince him otherwise. The hermit crab, purple anemone, and prickly bristle worm all work together to make the little shell the best possible place to live. However, things soon get to crowded in the hermit crab’s tiny shell which leads to a big argument. Luckily, the small bristle worm brings everyone happily back together by finding them the perfect new home. 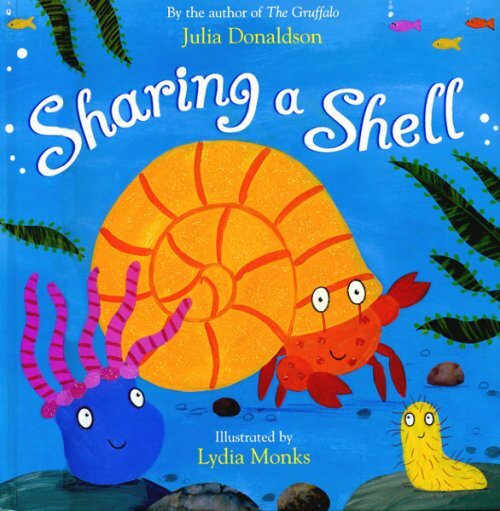 Sharing a Shell is a delightful rhyming book with vibrant glittery illustrations to capture the attention of little eyes and ears. This story highlights the important role that sharing plays in building lasting friendships. The characters work well in a team, each doing their own job to keep their little worlds running smoothly. This story could be a great springboard to a discussion around using our individual strengths to cooperate with one another in a team. The bird's eye view pictures of the rockpool allow for opportunities to target prepositions (e.g. “what’s hiding behind the seaweed? Who is under the rock? What can you see in the middle?”). This book would also be a fantastic choice for children working on the /sh/ speech sound. For further speech and language targets in Sharing a Shell, see the list below.